Facebook and YouTube have taken down content promoting illegal animal bloodsports following an investigation by the BBC's Countryfile programme. But both websites still host users who feature graphic videos and photos showing banned cockfighting and hare coursing taking place in the UK. Facebook did remove one user and said content "must respect local laws". YouTube said it had removed all material highlighted by the BBC that broke its policy guidelines. But much of the material found on both sites, in both private and public user groups, remains online. Hare coursing, which sees hares hunted by dogs in competition against each other, was banned by the Hunting Act 2004 while cockfighting was made illegal in the 19th Century. Geoff Edmond, the RSPCA's national wildlife co-ordinator, who viewed the online material uncovered by Countryfile, said: "We would ask for responsibility. It should be taken down - it's illegal activity. "It's down to these social media companies to take on that responsibility. At the moment, we are still talking to them to be responsible in the hope that that will happen. "But I would always urge the public to call it in to ourselves or the police because what matters to me is stopping it." The programme's investigations team monitored a number of YouTube and Facebook users and accounts over several months, including two private groups that together had more than 31,000 members. 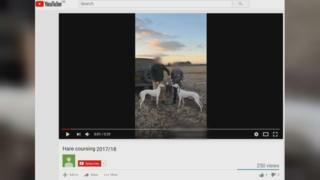 Images and footage were posted showing hares being caught and mauled by dogs, trained cockerels fighting to the death and users mocking the ban on hare coursing. Young children are featured in some of the footage and photographs. Police forces across the UK told the programme the organisers of illegal bloodsports are also using social media apps to share and livestream material - to enable wider gambling. Sgt Kevin Kelly, of North Yorkshire Police's rural taskforce, said mobile phones seized in a raid on a cockfight last year showed that fights were taking place every two weeks - and footage was being share much more widely. "You can stream things that are encrypted, you can have private groups, you can have chats, you can share your videos and you can organise events. It's a lucrative business," he said. Sgt Tom Carter, of Sussex Police's rural crime unit, said the crackdown on hare coursing in the UK meant some hare coursers were going abroad, holding events and streaming footage back to the UK. He said: "We've got hare coursers that are making six-figures annually purely from hare coursing. They can livestream that to their friends in the pub or other people that are betting on it. "It can go international. It can go to other countries where people are betting on the dogs. You can use money transfer or even cyber currency to put the bets on." Countryfile provided both Facebook and YouTube with links to the evidence of illegal bloodsports and hunting its researchers had found online. Facebook removed one profile while YouTube said it had removed any material that broke its policy guidelines. A spokesperson for Facebook said: "Content on Facebook must respect local laws and adhere to our community standards. "When governments believe that something on Facebook violates their laws, they are able to report this to us so we can take suitable action. This applies to things like bloodsports, where we rely on reports by the appropriate authorities." In a statement, YouTube said: "YouTube has clear policies that ban graphic content and animal abuse and we remove videos violating these policies when flagged by our users." The full story features on Countryfile on BBC1 at 19:00 GMT on 17 February and afterwards on the iPlayer.